Last year Tom White made this short experimental film documenting Swindon's infamous 'Magic Roundabout'. Using layered sound and abstract images, the film is collaged with soundbites from local residents and an unsettling soundtrack. 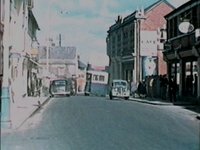 The film is intended as a homage to the late Frank Blackmore, of the British Transport and Road Research Laboratory, inventor of the mini roundabout. Swindon's famous example was constructed in 1972 according to the design of Frank Blackmore, under the control of Highways engineer Jeff Maycock of Swindon Council. The official name of the roundabout used to be 'County Islands' but was changed in the late 1980s to match it's popular name 'The Magic Roundabout'. It inspired the song 'English Roundabout', a Pop song by the Swindon ban XTC, which was recorded for their 1982 album 'English Settlement'. A calender is produced each year by the UK Roundabout Appreciation Society depicting the town's finest examples. In 2005 it was voted the worst roundabout by a UK Insurance company. In 2009 it was voted the 4th scariest junction in Britain in a poll by Brittania Rescue! However, the roundabout provides a better throughput of traffic than other designs and actually has an excellent safety record, since traffic moves too slowly to do serious damage in the event of a collision. There are no comments for "Swindon's Magic Roundabout".